When you first delve into this game and especially its awesome community, you may come across some terms that you may not have known. Some terms are common and shared between various games, others only apply to this community. So in order to bring everyone up to speed with the terms of this game, read on! Time to show your gaming buddies that you are just as big of a nerd as they are. This list will not be complete, so if you are missing any terms, let me know in the comments or via other means. I will be happy to add the terms to this list. Aggro – You are playing aggro (aggressive) if you are trying to accelerate your board state advantage as fast as possible. Some scenarios really force you to have an aggro deck. The opposite of aggro is turtling. Quests like Race Across Harad are good examples where you will need an aggro gamestyle. Alt Art – Either official or fan-made custom artwork for cards in this game, usually heroes. These cards have a high collectable value and will be great to bring out to the table in a multiplayer game. Alternative Universe – If you find yourself near the win over a scenario, but a game-ending encounter card is revealed first, the players can negate that card and enter an Alternative universe where that card didn’t pop up. If the players managed to win this way, this victory must have an Asterisk (*) in its log. AP – Adventure packs, holds 1 scenario, 1 hero, and generally 9 new player cards, with 3 copies of each. 6 Adventure packs in order make up a cycle. Archetype: A specific description of a certain deck with a range of variations. Dwarf Swarm, Silvan Tempo, or Dunedain Trap for example. See this list for more information on specific archetypes. Armoury – A deck that focuses on getting out a lot of Weapon and Armour attachments out. Armoury decks tend to run cards like Open the Armoury, Tactics Bofur, Master of the Forge or even Master Ironsmith to get their attachments out faster. This deck style tends to make good use out of cards like Sterner than Steel, Foe-Hammer, and Goblin Cleaver. 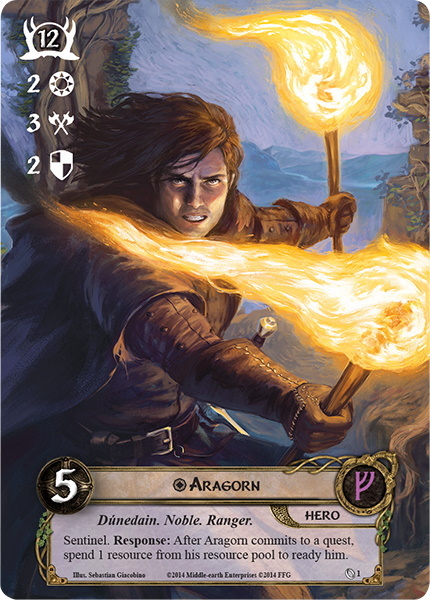 Barwen – When one of the heroes in play is Arwen Undomiel, but another deck is running Ally Arwen as well, the ally is renamed Barwen to avoid uniqueness issues. A sharpie may be used to rename the ally if needed. Bike spokes – (Coaster, Binder fodder) A place where a lot of underwhelming cards end up. When riding your bike with these cards between your bike spokes, it makes a cool rattling sound. This is all the use these cards tend to have. Buff – A boost to a statistic on either your character or on enemies. Negative buffs are named debuffs. If there are a lot of buffs active at a time, you may be looking at a combo. Board State: The overall game position of the players relative to the encounter deck and staging area. 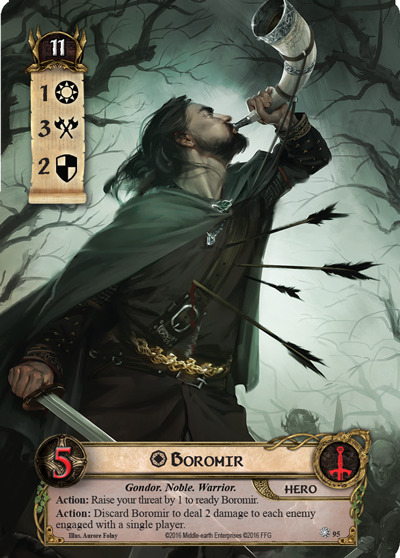 Boromir Bomb – Actually using Tactics Boromir’s second ability with which you discard him. This is a very rare thing to do, so this has gotten its own nickname over time. Broken: A card combo that exploits elements of the game to produce effects that were never intended to be possible, such as infinite combos that trivialize the game. Cardboard generation – The generation of players who still got their Adventure Packs in cardboard casings as opposed to the plastic shells that are used now. CE – Collectors Edition, a special limited edition set that was released by FFG a while ago. This version featured loot for both the card game and for the digital game. Cards from this set can be distinguised by their alternative framing. Cheating – Not following the rules as set up by the game. Is generally frowned upon, but in a solo game, who cares? Cheezing – (Exploiting) Taking advantage of a game mechanic to your benefit. Think of stalling forever on Conflict at the Carrock or We Must Away, Ere Break of Day in order to set up for the later stages. If cheezing is done on a big scale and starts to break the game, check if you may be doing some Seastanigans. Chumping – (Chump blocking) Defending with an ally (usually a cheap one) with the knowledge that the character will die in the process. This method is useful in a pinch when the ally has done all that it can and is to no more use to you. Some famous chumpers are the Squire of the Citadel (see Toss the Boy!) and Snowbourn Scout. Clutch: Getting a lucky draw at an optimal time or being lucky enough to be able to play a card at a critical time. Combo – A combination of card effects that synergise well with each other, boosting your board state or enhancing each other. If the combo is counterproductive to your deck, it becomes a non-bo. Community – The blogs, forums, groups and other resources have made a quite close and friendly community for this game. I believe this is because of our shared interest in games and Tolkien lore, as well as the cooperative nature of the game. Check out this post on what different community resources there are. COTR – Cardboard of the Rings, a bi-weekly podcast about the Lord of the Rings The Card Game, WHICH is a living card game by Fantasy Flight Game, take it away Brandon. COTR – The accronym can also stand for Con of the Rings, which is a yearly convention for the LCG held at the FFG center. The event is a great way to meet most community members and sometimes even European players. Cube Draft – A mode of this game where players build decks out of a fixed set of cards (a cube) to make their decks. This can lead into some wacky decks as players are not given access to the complete cardpool and have to work with what they are given. Curve: The cost ratio of the cards in your deck compared to the resources your heroes are able to produce. DCG – Digital Card Game, another product that FFG has announced. This game has the looks of the LCG but is not exactly the same. Nate French: Original developer and creator of the game, he is also rumoured to have a powerful Solo Thalin deck that works great. Difficulty Rating – Best throw those out of the window and see how the community rates the quests. The official ratings tend to be off from time to time (Into Ithilien a 4? A 4???). Direct Damage – Dealing damage to enemies without having to go through their defence value. This is a great strategy to avoid nasty enemies from engaging you, as you can deal Direct Damage to them from afar, killing them before they become dangerous. Electronic players – People who play the game via the internet. This can be done via various platforms such as OCTGN or Table Top simulator. Engine: A combination of cards that gives card draw, resource acceleration, recursion, or other contributions to board advantage. Errata – The moment when a (player) card is fixed or balanced so that it no longer breaks the game. Errata are released together with an updated FAQ list every once in a while. FAQ – Frequently Asked Questions. A document made by FFG so that players do not ask the same question to the developers every time. A new FAQ list may also feature a list of new Errata’s. FFG – Fantasy Flight Games, the publisher of this game. FFG Police – The law enforcing branch of FFG. They will show up at your door whenever you continue a game where you made a mistake. Can be bribed with chicken and Mountain Dew. Gandalf guy – A player who brings the hero version of Gandalf to a multiplayer game. 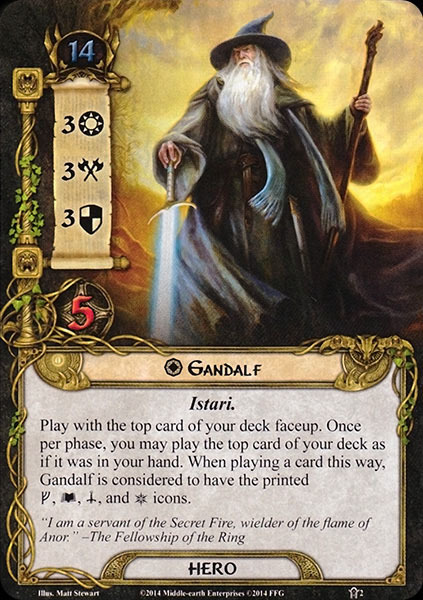 This blocks any ally versions of Gandalf from ever entering play, potentially halting some decks. This player also has a high chance of being Steward guy. These players are also annoying since the planning phase of the Gandalf guy will take forever, with all the different toys and effects going off. Gen Con – A popular, yearly convention where new expansions are released early and many events for this game are being held. Global – When a (de)buff is affecting all the players in the game. Going in Blind – Playing a new scenario for the first time without reading the cards and preparing for the encounter deck. Usually ends in defeat. Griefing – The act of turning against your fellow players by playing cards that are not useful to the group. This can include discarding Condition attachments with Power of Orthanc, reducing willpower on questers with Dark Knowledge, flooding the staging area with enemies and locations with guarded cards or 0 cost allies that pull enemies/locations or by using a lot of Doomed cards in order to threat out the other players. This is only to be done as a joke, but try to avoid these jokers. Hama-Feint lock – Though recently patched, this combination used to result in players recurring the Feint event with hero Hama. This completely shut down enemies and made combat easier. The errata to limit his ability made sure players could only do this temporarily. Hate – When the encounter deck is built around negating the usefulness of a specific deck style. This can be Ally hate for example, like Crossing of the Poros where allies must be exhausted during the start of the game. Hot Second – Period of time in which a Guarded attachment would be attached to a hero if it is discarded through Well-Equipped or Thror’s Ring. After the Hot Second, the Guarded card goes to the staging area, where it is then guarded by an encounter card. Journeys (in Middle Earth) – A new game by FFG that uses both physical and digital game elements to make a brand new adventure. While the game uses the same art as the LCG, it has no other ties to it, besides being set in the same IP. LCG – Living Card Game, where the contents of all packs are known in advance and the game keeps growing its card pool over time. Location control – The mechanic of handling locations in play. This can either mean exploring more locations than just the active location per turn, travelling without paying a Travel cost or negating location threat in the staging area. A very useful deck to bring in multiplayer quests. Location lock – The moment when the locations in the staging area are adding too much threat so that the players cannot quest over it. This tends to occur in some multiplayer quests where you can only travel to 1 location each turn. Location control can be a good counter against this. Loot – A piece of equipment that was custom made by somebody that does not officially belong to the game. Loot is highly collectable and the people who produce it must be kept as close friends. LOTR – Lord of the Rings, come on, you know this stuff. Lure (of the Ring) – This is the only official European event held each year in Germany. While initially organised for the CCG, it has been the host of many LCG players in the past few years. Many Europeans gather here in case they cannot make it to the other 2 events in the United States. 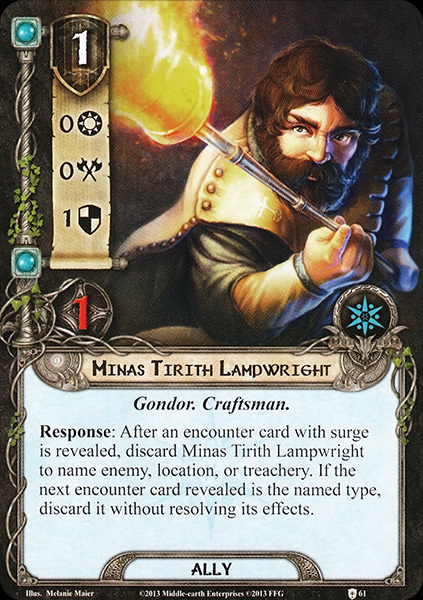 Minas Tirith Lampshite – It is just the card Minas Tirith Lampwright, but as he and his effect are useless in most cases, he earned this nickname. Mining – The act of discarding cards from your deck with Dwarves that specialize in this. Mining can lead to free allies, boosted abilities on characters, and a lot of extra resources. Mulligan – If your opening hand is not to your liking, you may shuffle it back into your deck and draw 6 new cards. This is limited to once per game, and only during setup. If your hand is still not to your liking, you will have to scoop. Naked – (Bare) A hero without attachments. All heroes start the game naked and will need some attachments to lose this trait. Some heroes stay naked for the majority of the game, as they do not require any attachments to work, like Tactics Eowyn (TEowyn). Nerf – No, not the foam darts, nerfing is when a card is brought down to a level where it is more balanced than the previous version. In this game, this is usually done by limiting the number of times you can use the action on that card. For example: “Caldara was nerfed to limit her ability to once per game”. Net-decking – When you are taking a look at a decklist from somebody else and copy that decklist. 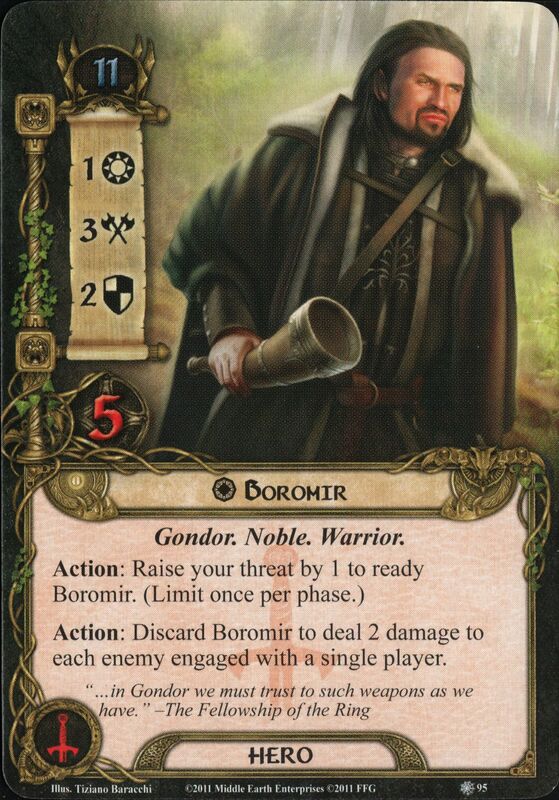 As opposed to other games, net-decking in LOTR LCG is encouraged to new players to understand combos and synergies. Check out RingsDB for a lot of decklists you can copy. Neutral – It is indeed not a sphere. Ninja’ed – A term to be used when someone else has the same comment as you but posts it just a bit quicker. In real life, this is known as jinxing. NM – Nightmare mode. It is like the regular quest, only with mistakes fixed and loopholes plugged. Read more on the different modes here. Non-bo – A combo that is counterproductive to your game. Think of a Boromir in a Secrecy deck, Ents with Galadriel, or Secrecy cards with a hero lineup way above 20 without threat reduction. Noob – (Newb, Newbie, Greenie) A new player to the game. These players need some help understanding the rules but will catch on quickly if you can invest some time in explaining the game. OCTGN – (pronounced Octagon) A digital platform for the game where players can play multiplayer games with players from around the world. You are left to the fate of your router though, so that may be worth improving before trying this out. One Deck to Rule Them All: A vain fantasy of creating a deck that can beat every scenario. See also Seastanigans. Patreon – A place where you can sponsor a lot of community resources. Great way to show your support for blogs and podcasts. Physical players – People who play with the physical copy of the game and not via the internet. This is the group who spends a fortune on storage solutions and sleeves for the sleeves of their cards. Plastic generation – The newer generation of players who are getting plastic shells on their APs. This generation will also be recognisable by their shrunken down Core Set and tiny threat trackers. Pom Pom Aragorn – The version of Aragorn where is holding two burning brands in his hand. This looks a lot like a pom pom used in cheerleading. Proxy – Using a card as if it was another card that you do not have a copy of. This can be done to build decks around cards that have not yet been released or that you do not own yet. This way you still get to use them in a deck. Pulling a Caldara – Using Caldara’s ability to bring out allies. This was a big deal until a recent patch that limited this ability to once per game. Caldara was a very strong archetype before that time. Quad-sphere – A deck that uses cards from all four spheres of influence. This tends to need some access to other spheres through Songs or other attachments. Other types of decks can be Mono-sphere (1), Dual/Bi- sphere (2) or Tri-sphere (3). Rage questing – Absolutly steamrolling an easy quest after you have become frustrated by losing to more difficult quests. This tends to happen to quests like Passage through Mirkwood and Encounter at Amon Din. Retcon – The act of retracing your steps as you may have misplayed something. It is generally accepted if it is not done for an event longer than half a turn. If it is really vital to your survival at the end of your game, you may enter an Alternative Universe. RNG – (Chance, RNGsus) Random Number Generator, the cause of a lot of impossible encounter card combination due to the randomness of the decks. 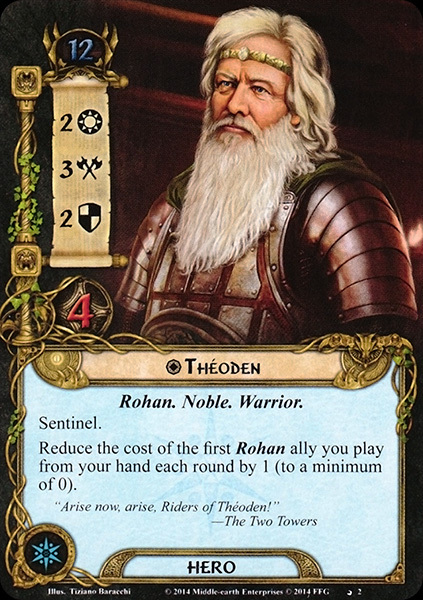 Santa Theoden – The Spirit version of Theoden looks an awful lot like Santa, so the community dubbed him Santa Theoden. Be good and you might find a pony in your stocking this year. Scrying – The act of peaking at either your own deck or the encounter deck. This allows players to anticipate encounter cards or reorganise their own decks. Can only be done with specific player cards. Scooping – (Resetting, Restarting) This describes the act of having to reset your game early on if things did not work out in the early game as you would have hoped for. 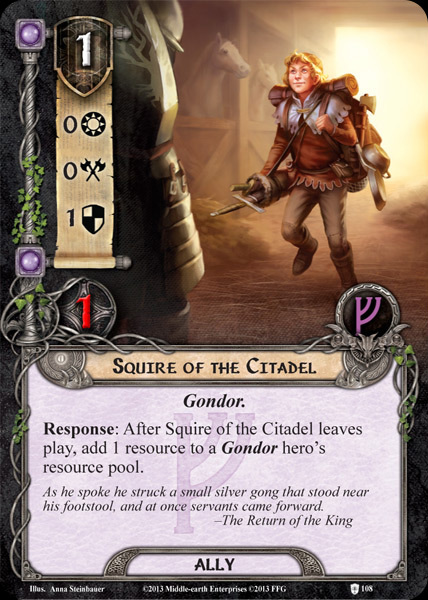 Quests like Escape from Dol Guldur are a good example of a scoopable quest, where you will have to reset often for the ideal opening hand and captured hero. A repetitive Scoop can lead to Table Flip. Scoops will be counted as lost games. Seastanigans – The point at which you take full control over the encounter deck and break a scenario completely. Symptoms of this may be an infinite resource loop, playing all allies in the card pool or removing the encounter deck from the encounter deck. This term was named after the player known as Seastan, who had a lot of whacky decks that make use of these loops. An example can be found here. Shadow-train – The moment when a shadow card forces you to take more shadow cards, which then lead into even móre shadow cards. This usually means the end of your defender. Shadow-trains were quite common during the Against the Shadow cycle. Side-board – An extension of your deck where you can store cards you might need for specific scenarios. Condition removal cards are such cards that are useless in some quests, but vital in others. At the start of the game, the players can add or swap any card from their sideboard into their deck for that quest. See also this post. Snipe: Killing off an enemy in the staging area before it can engage a player. Usually, this is done by heroes like Haldir, Argalad or a Ranged hero with Hands Upon the Bow. Spideresque – Having the characteristic of a spider. See the full wiki page here. Applies to most spiders, and some hosts of podcasts who shall remain nameless. Sphere bleed – The 4 main spheres in this game all have their unique playstyle and mechanics. If another sphere also starts to show these mechanics, you are talking about sphere bleeding. This could include: Threat reduction in Tactics, Healing in Leadership, Card draw in Spirit, and swarming in Lore. Sphere bleeding can lead to more independent mono-sphere decks. Splashing: Having a few cards of a sphere that is minor in your deck compared to its primary sphere. SQ – Side quest. A quest that is not the main quest. This can either be a player side quest or an encounter side quest. Staples – A card that is so good at what it does, it finds its way into a lot of decks. This makes it a very common sight in a multiplayer game. If the card in question is unique, other players may start to call you “title of the card” guy, for blocking their copies from entering play. For a list of staples, check out this page. Steward guy – The person who claims Steward of Gondor as “their deck doesn’t work without it”. This blocks any other player in that game from getting the attachment to make their deck work. Surge-train – An (encounter) card that surges into another encounter card, which then again surges into yet another encounter card and so on. This tends to happen in games like Into the Pit with Signs of Conflict. Minas Tirith Lampshite can make an end to this. Swarming – The act of churning out a lot of allies that synergise well with each other. Examples of swarms are Outlands and Dwarves, which gets to a very boring (yet powerful) level after a short while. Table Flip – (Quitting, Giving up) The act of being so frustrated at the game that you flip your table with all of your cards and token still on there. If the table is too heavy to lift or bolted to the floor, swiping everything off with your hands is also acceptable. Tech – Cards that handle a specific issue in your game perfectly. Teching for a quest means that players are taking their time and reading about the quest. This allows them to build specific decks that best counter the encounter deck, increasing the chances of winning. Tempo: The pace at which you are gaining board advantage. Some quests like Race of Harad require a very high tempo if you want to make any chance of winning. The Game is Dead/Dying – (Lie) A notorious meme about the state of this game. People who say that this game is dying are not the people you want to be around for long. The game is alive and well and will continue to be so long after the Age of Men. The Golden Rule/Grim Rule: When faced with a rules question that you don’t know how to resolve, choose the option that makes the game harder. Themurder – A game where you have to find the thematic reason why a card and its effect match. Tighten Our Belts, for example, allows characters to save some money for food in the next turn if they don’t spend it all at once. Toss the Boy! – Ah, Squire of the Citadel, the perfect Chump character. When you are chumping with this character against a big enemy, you just toss the little boy in front of the enemy and steal his wallet. Tower Defender – A character (usually a hero) that has a lot of attachments on him to become the ultimate defender. This usually consists of Armour, Weapon, and Readying attachments. Tower Questers are also a thing, though less common. Toys – Attachments that were custom made for a specific character. Galadriel has her Mirror and Nenya as toys for example. Giving a character a lot of these toys can make it go into Voltron mode easily. Turtling – (Stalling, Delaying the inevitable) Waiting early in the game to build up your board state and not advancing the quest. Stalling for long can help in the later stages of the game to more easily overcome a boss enemy for example. Keep an eye on your threat level though, as this prevents you from turtling forever. Utility: Card effects that are highly useful in many cases (when revealed cancellation, attack cancellation, buffing, card draw, etc.). VD – Victory Display. A display where cards with the Victory keyword end up after they are defeated. Player cards can also interact with this display. Voltron mode – When a hero has all of his attachments attached to him. This tends to happen with characters like Aragorn, who have a lot of specific toys. You need at least 3 different attachments on a hero to make it go into Voltron mode. Westfold Horse-Whifferer – When a Westfold Horse-Breeder does not find a Mount attachment in your top 10 cards, she is renamed Westfold Horse-Whifferer. These characters tend to be used for chump blocking shortly after. Whiffing – When a Search your deck card like Raise the Shire or Westfold Horse-Breeder do not find any cards you may take to your hand. This is a stroke of bad luck and a waste of resources in most cases but it happens to a lot of us. Build your deck with a higher percentage of these cards to make sure they hit. Wilson – The Dunland Prowler from the Ringmaker cycle looks like he has a volleyball for a head. This earned him the nickname of Wilson over the years, after the volleyball from Cast Away. It is mandatory that you cry “I’m sorry Wilson! !” whenever you kill this guy. Wrecked – (Smashed, beaten, defeated) When you never stood a chance against the scenario. Tends to happen to the more difficult scenarios if you are going in blind. X – A value of 0 unless otherwise specified. Blanking a cards textbox will likely make this value 0, which is great when handling Nameless Things. Yolo questing – This is the point in the game where you only need to make a bunch of progress onto the main quest and you have won. In order to do this as soon as possible, you commit every character to the quest. It is now or never. If you fail, you will likely die in the combat phase, so you put all your eggs into one questing basket. You only live once, so why not risk it? Vision of the Palantir is not responsible for any games lost this way, please express your anger towards the sky by shaking your fist at it. * – An asterisk can be added to your game if you didn’t follow the rules exactly. This originates from the early videos on YouTube, where mistakes were pointed out with this symbol. Can’t have a perfect game. This usually leads to an Alternative Universe. With so many versions of different heroes, it can be confusing to just say that you are running Aragorn. To narrow things down, you can say the sphere before the hero, but who has time for that? That is why players tend to use the first two letters of the sphere and glue it at the front of the hero’s name. This leads to names like Sporfindel (Spirit Glorfindel), Loragorn (Lore Aragorn), or TTheoden (Tactics Theoden). Alternatively, if the hero was a part of the Core Set, it may be referred to as Core (name here). This yields heroes like Coragorn (Leadership Aragorn and Corefindel (Lore Glorfindel, also named Lorefindel). Keep this in mind when seeing a name you don’t recognise. Players don’t have time to write down every single title of the cards they are using. So they tend to abbreviate the titles to the first letters in the title. We are not Idle becomes WanI, A Very Good Tale becomes AVGT and so on. I hope this helps you on your way to navigating the forums and the videos this community is putting out. If you have any additions to this list, let me know and I will update it. Thanks to everyone who has helped to compile this list. I just thought of a term that should probably be on this list: DCG, for the digital version of the game produced by FFI. Oh my gosh. Just saw Barwen. Without seeing this I did the exact same a few weeks ago, and called her Barwen and everything. That is freaking amazing. A happy coincidence. The term got coined to me in a playthrough of the Cardboard of the Rings guys who suddenly had both versions on the table. Nice to hear that it is a community wide term now!